Xiaomi sub-brand Huami is continuing its march into the world of wearables with the Amazfit Bip. It's a budget smartwatch that bears more than a passing resemblance to the big boy in the smartwatch world, the Apple Watch. And when we say budget, we're talking budget. this thing costs $100, which puts it in Pebble territory (RIP) and even cheaper than the Ticwatch E, one of the least pricey (but good) Android Wear smartwatches you can get your hands on right now. Other than its familiar looks, the big thing the Amazfit Bip has going for it is its 30-day battery life. Well, 45 days if you cut out some features, but 30 days is still massive compared to the competition - and certainly a huge distance from its doppelgänger. So, does Huami's budget smartwatch pack a wallop or value, or is it too good to be true? That's what this review is here for. Let's get to it. 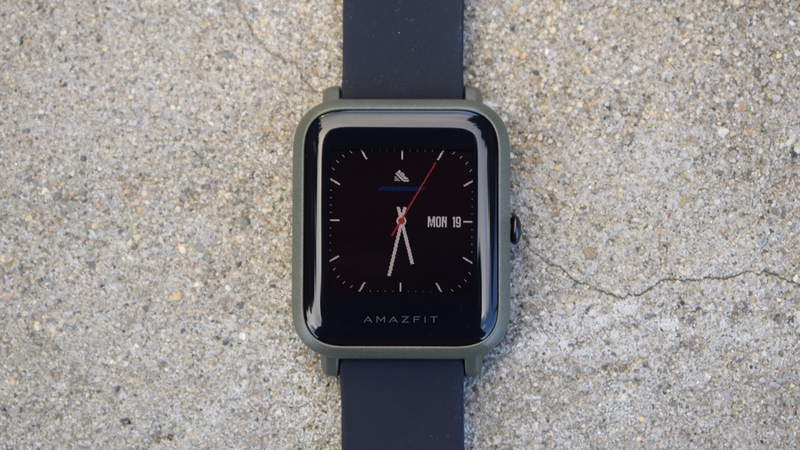 There's no getting around it: the Amazfit Bip looks very much like an Apple Watch. It's got that same square shape with rounded corners; the same curved glass that glistens around the bezels. There's even a crown on the right side, though it's only a button and doesn't actually spin. While it looks like an Apple Watch, it doesn't feel like one. The Bip feels, and looks, a bit like a Fisher Price version of Cupertino's smartwatch. It feels off-brand and basic. It's extremely plastic-y too, and you can feel it. The silver lining of this design is it's so light (31g) that at one point I forgot I was wearing it. So it's pretty comfortable. There's an always-on reflective 1.28-inch color touch display here, but that always-on display isn't always touchable. It'll show your watch face and periodically update, but you can't actually do anything until you press in that crown. One you do that, a wave animation spreads across the face, signifying that it's come alive. You'll then be able to scroll through a variety of options. It's easy enough to get used to, though activating the watch by pressing the crown can get a bit annoying sometimes. We've been conditioned to tapping our displays to turn them on and get moving, so clicking a button on the side is a bit unnatural at first - though it does help reduce battery consumption. The display itself isn't the brightest thing you've seen and not the most visible in sunlight without a tap of the crown to wake it up. Really, it's the epitome of fine, protected by a 2.5D Corning gorilla glass with some antireflective coating. Elsewhere, you've got a heart rate sensor, a compass, a barometer, GPS and GLONASS, an IP68 rating, and 20mm watch straps that you can swap out should you want to get your fashion sense on. Be warned: those default straps are a dust magnet. So while the Bip is extremely light and comfortable, it's very difficult not to want to write it off because of its - frankly - tacky and laughably familiar design. I even had someone ask me which Apple Watch I was wearing, only to have to frown and tell them that it's not an Apple Watch but an imitator. Judgments will ensue. The Bip features a heart-rate sensor, GPS, GLONASS and a companion app that's not shy about giving you whatever data you need. So while the Bip's looks may be unassuming, it's best not to judge this book by its cover. The Activity app features a number of workouts. You can take it on a treadmill, you can go for an run or a bike ride outdoors, or you can even go for a walk. Getting a workout started is easy enough, though GPS for your outdoor cycling and running will take a moment to get a lock. Compared to the Garmin Vivoactive 3, the Bip took an extra 30 seconds to get a fix on GPS. Once it did that, however, it remained steady. I went for an outdoor run with both, and I decided to change up my usual running routine with a bit more variation, and it accounted for these slight variations - save for one section where my route looked like a two-year-old had squiggled it in crayon. Funnily enough though, on a second attempt, this time against the Garmin Fenix 5S, the Amazfit was spot-on, and it was the Garmin that went a bit off kilter. Within the companion app, you'll get some detailed statistics about your run. Your time, pace, calories burned, speed, heart rate, strike and more are all here. You'll also get heart rate zones. So how does the heart rate tracking perform on the Bip? Much better than expected. It's hard to not judge something on first impressions, but when I first picked up the Bip, my hopes were about as flimsy as the plastic design. But put up against the Polar H10 heart strap, it did a decent job; my maximum heart rate was the same on both, and my average was only a couple of BPM off. It might not offer enough to recommend as a watch for serious runners, but for a $99 smartwatch, it does an impressive job. What about sleep tracking? Though a lot of this is down to some of the insights that Mi gives you, rather than the device itself. After a night of sleep, Mi will give you a sleep rating. It'll tell you how your sleep ranks compared to other Mi users, and then it'll break it down between deep sleep, light sleep and awake time. This part of the breakdown isn't that good. I'll explain. One night, it told me I had an hour and 57 minutes of deep sleep, 4 hours and 35 minutes of light sleep and no awake time. That gives me a total of 6 hours and 32 minutes of sleep. However, the Fitbit Charge 2 logged me in at 4 hours and 50 minutes of sleep - which was correct because I woke up at 4am and couldn't go back to sleep until 6am. The Charge 2 recognized that I was awake and tossing around, the Bip did not. The pleasant part of Bip's sleep insights is that it gives you very specific insights. For instance, it told me that I slept too late and offered an earlier bed time. It also keeps track of sleep regularity, letting me know if I've been keeping to a standard bedtime and whether I've been waking up at a consistent time as well. That stuff is all super cool and interesting, but it also feels extremely hollow if it can't get the simple stuff right. When I was just using the Bip by itself to monitor my sleep, I was thrilled with it. As soon as I put it up against the Charge 2, I lost all confidence in what it was telling me. The Bip has some ideas about fitness, and the Mi companion app is trying really hard to making it all feel cool and useful, but if you can't trust the methods of picking up that data it all feels a bit shallow. The Bip doesn't have an app store. And, actually, it doesn't do a whole lot that might blow you away. There's no music storage here, for instance, so if you need your tunes, you'll also need your phone. There are notifications though, which you can customize in the companion Mi app. You'll get your call alerts, event reminders and app notifications, but there's way to respond to any of them. Elsewhere, you've got a weather app. This is configured through the companion app, though my weather app stopped working after a couple days. For some reason, when I synced my Bip to the app it wouldn't update the weather - annoying. There's also a compass, a stop watch and a timer. The timer and stop watch worked about as well as you expect them to, but I had trouble getting the compass to work. To prime it, you have to wave your arm around in a figure-eight movement. After minutes of waving my hand around like an idiot, absolutely nothing happened. So I gave up and never opened the compass app again. And, well, that's pretty much it. The Bip doesn't pretend to be a premium smartwatch, and that's certainly the case in the features section. In hindsight, you could probably tell this as the website lists its light weight as a feature. Huami promises 30 days of battery life for the Bip - 45 if you turn off features like notifications and minute-by-minute heart rate. So does this sounds-too-good-to-be-true number actually hold up? Let me put it to you like this. I got the watch a couple weeks ago, took it out of the box and saw it was at 46% battery life. Since then, I have not charged it. I've turned on notifications, I've been running with GPS enabled, I've used minute-by-minute heart rate detection and at the end of my two weeks the watch was down to 26% battery life. The Bip never alerted me that battery life was low. I had no clue until I went and checked on it myself. So yeah, the battery life on the Bip is great. You are sacrificing a bunch of features to get this insane battery life, but not having to charge your smartwatch will always be a blessing. If your number one concern for smartwatches is battery life, the Amazfit Bip is for you. It will make you very, very happy - if you don't mind sacrificing the above features. I've bought one on Black Friday for 50 bucks and regret it the next moment, as poor watch not even worthy than value. However meanwhile it arrived, and I was pretty impressed, design its not so poor as I tough and you describe, actually far from a top brand its well made and good construction. Neither should it be seen as a cheap imitation of Apple watch, ok it's similar, as it is similar to Pebble or any other rectangle watch. - Having good battery life comes at price of not having a OLED/LCD beatifull screen. This is an acceptable Smartwatch in the same vein as a Chevy Spark is an acceptable car. If price is your 1st 2nd and 3rd deciding factor.....sure. I've been using one of these for the past 3 months and been very impressed. The battery life is a joy and that, combined with decent GPS and HR tracking and syncing to Strava/Runkeeper via 3rd party apps makes it a great buy. I think this watch is good in little price and just for little motivation to do healthy activities in daily life, but it doesn't give me the accurate reading about heart rate or my running speed. So I am little disappointed and don't know that how this watch is generating fake values. Very fair and unbiased comments. I too share the very same opinions, thank you for sharing your thoughts. I've discovered you can vastly expand your watch's capability with third party apps. I'm using notify for amazfit, and you can also get Amazfit Tools. Both turned this from kinda cool to stellar. I love it, and it's got way more functionality than my old Fitbit Alta... Which cost me $120 on sale! Brutal review. You're closing the deal.